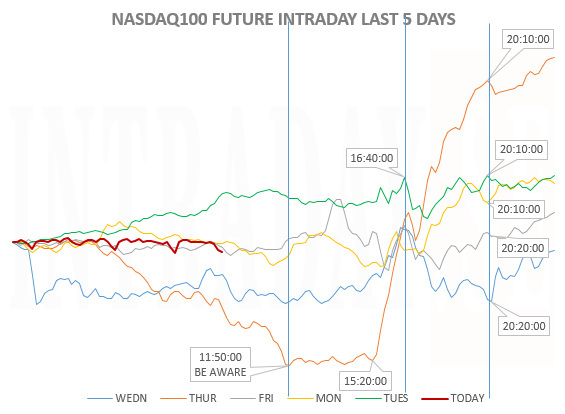 Todays chart for tomorrow (Friday), shows quotes for the Nasdaq100 Future index. 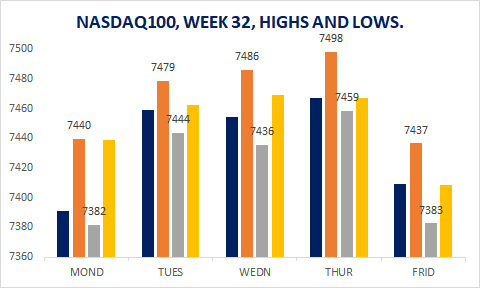 The last weeks have seen weak development for the entire or the latter part of Friday's trading. As you can see, Friday sessions are quite until at least 12:00, but more from around 15:30 (US Open). Times are GMT +1 HR. 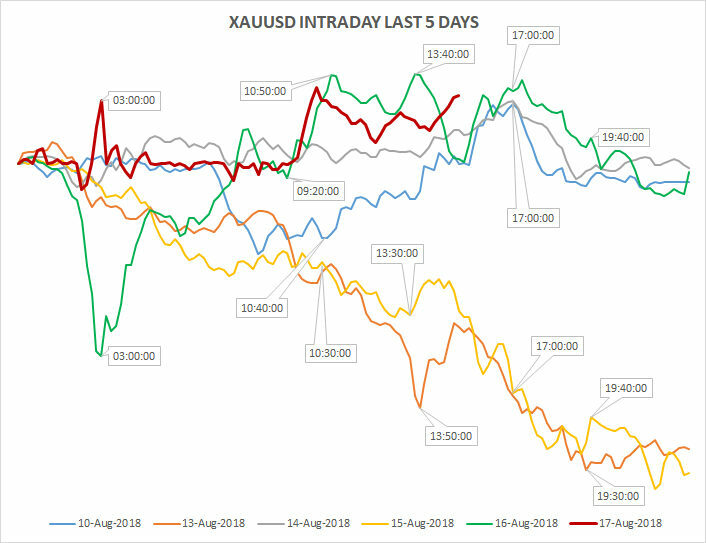 Last 5 Fridays price development for XAUUSD displayed. 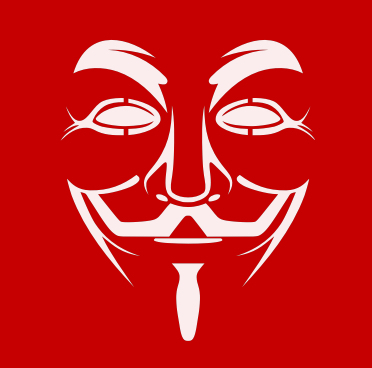 It could be worth having the timewindows in mind for support, resistance or accelleration to the price. There is never given that a certain timewindow will be support or resistance to price to mark a turnaround for the next minutes, but it happens. 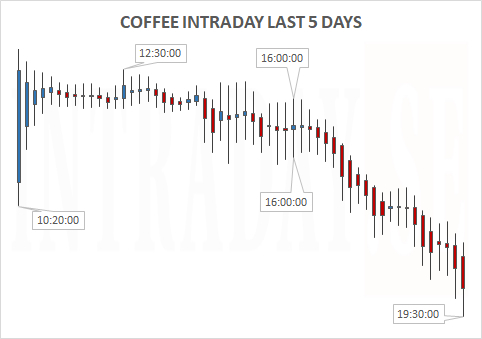 See for example the chart above how the next minutes from 14:10 appears, or the shortselling around 17:00 with a tight stop loss which generates a fine profit to exit around 19:30.. 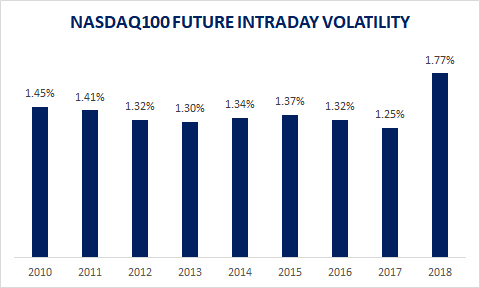 The Nasdaq100 future this passed week. Highs and lows in an average graph. Most movements surrounding the US open @ 15:30 (GMT + 1 HR.). 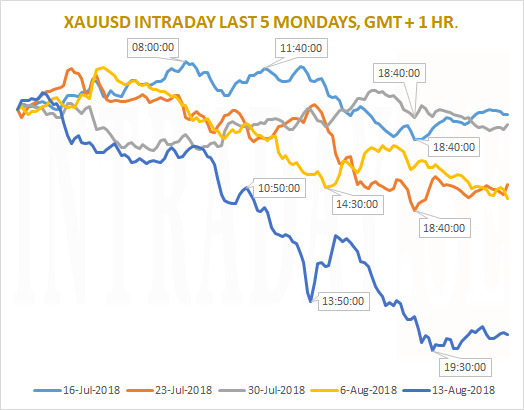 Goldprice in USD for the last 5 Monday's displayed. 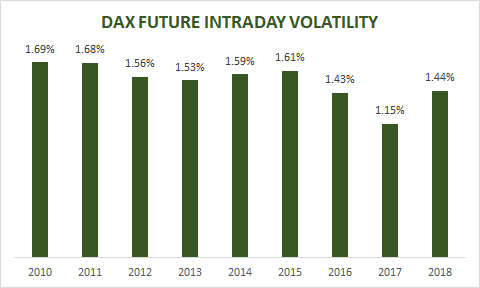 The German DAX index future this passed week. Highs and lows in an average graph. The green line represents a 6 bars moving average. Remember that all times displayed are set to GMT + 1 HR. 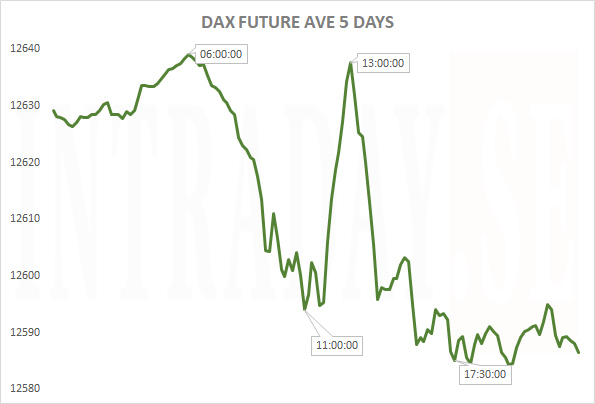 Highs and lows for the DAX Future for the last 5 tradingdays. Here are the silver prices of the week - average development. The chart above displays times of highs and lows (GMT + 1 HR). 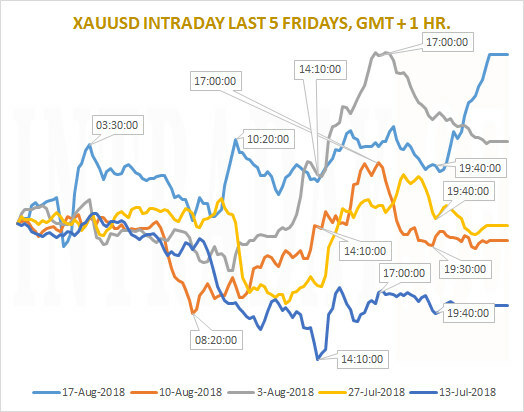 There are 138 10minute bars per tradingday (6 per hour). Silver had a sliding week, and an attempt to recover its losses on Thursday and Friday. As seen on the chart, 10:20 AM is an important time window, as is 17:00 PM and just after 19:10 PM. 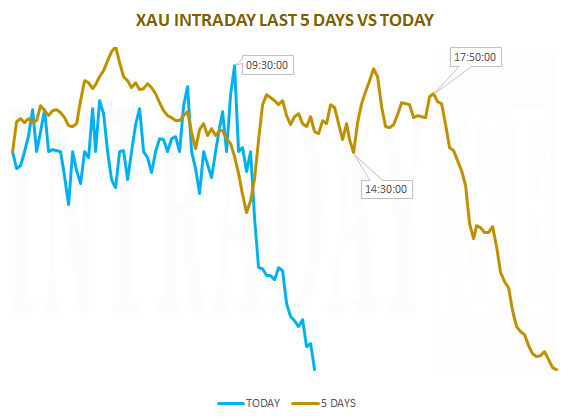 Gold behaviour for this passed week put together in one intraday graph. Times displayed are GMT + 1 HR. 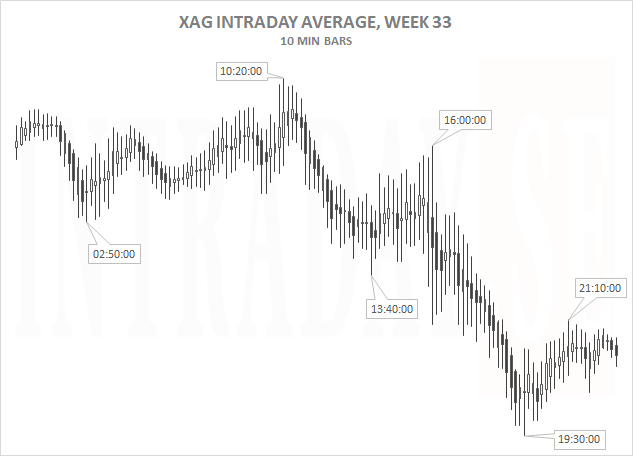 There are 138 10minute bars per tradingday (6 per hour). 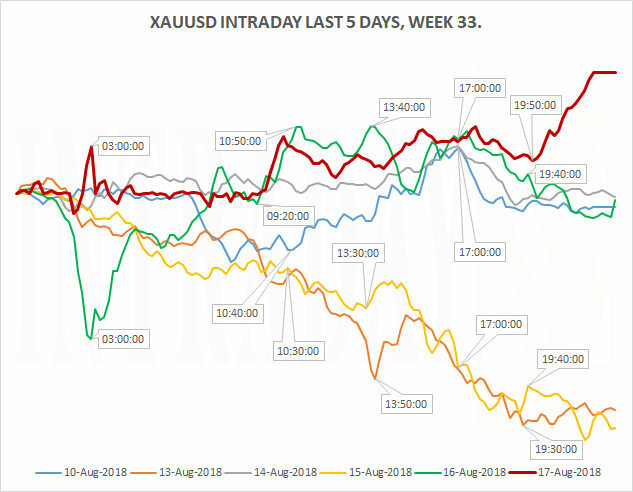 XAUUSD started the beginning of the week with sellingpressure. Friday was inverse to Monday and Wednesday. Shortcovering and or a potential key reversal Thursday could have triggered the stronger last day of the week. Times are GMT + 1 HR. Times are GMT + 1 HR. 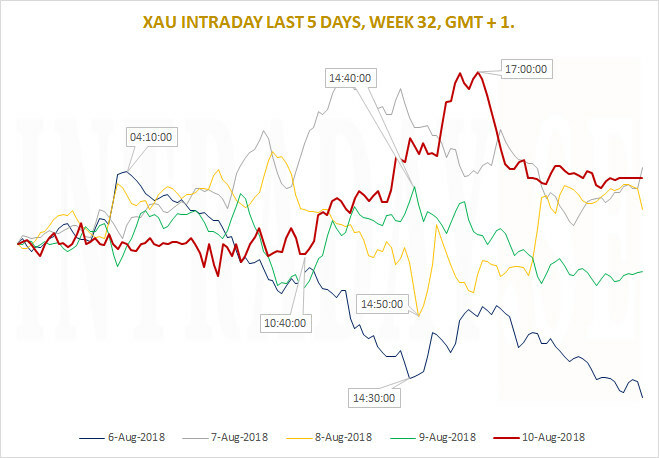 Gold performance every day last 5 tradingdays. 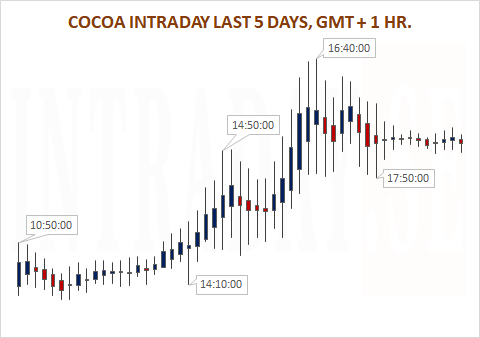 Friday was the strongest intraday, and its momentum started around 10:40 GMT + 1 HR, similar to Thursday but faded. It did fade from just before European close Friday as well, but held somewhat better. 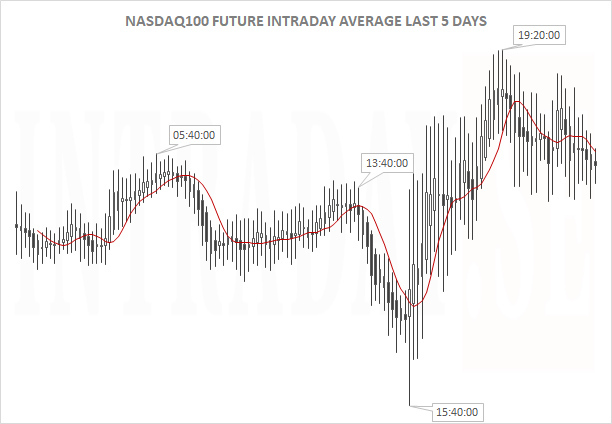 Nasdaq100 Future intraday average development this passed week, GMT + 1 HR. Each bar represents 10 minutes and includes its Open, High, Low and Close. The red line is a 6 bars moving average to show strenght and weakness. 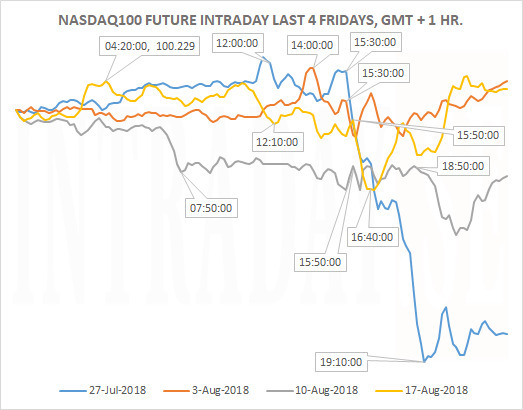 Below you see the opening hours for NASDAQ100 index (not future) for each day incl. Open, High, Low and Close. As you see, the Monday low was challenged on Friday to close below its opening price. The European DAX index ended the week to the weak side. 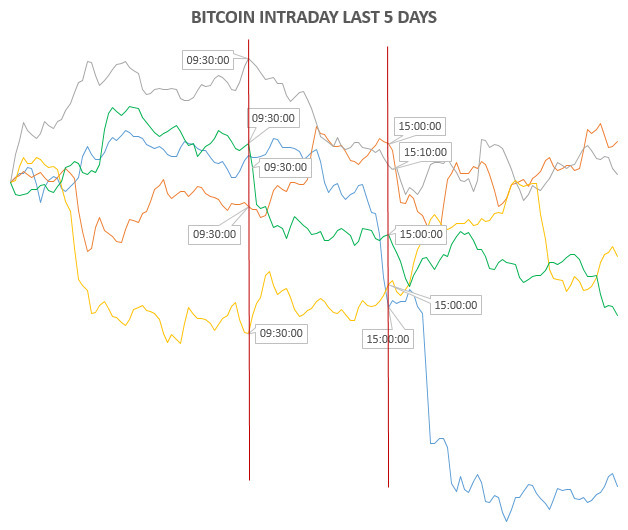 Here you see each tradingday individually, to match the moves for comparisons. As you can see, markets are quiet throughout the Asian sessions. 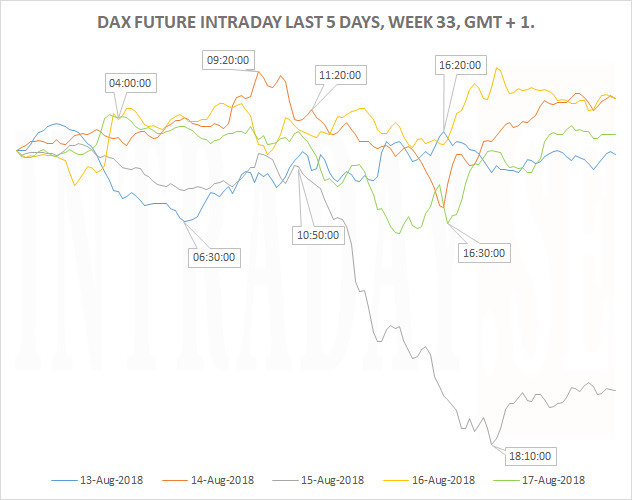 Sellingpressure for the DAX amounts in the European mornings, except Tuesday and the somewhat stronger Thursday. After the European close, the future index does not move much. A clearer picture of the entire week is drawn below, showing the average direction for the 5 sessions above through our own formula. The diagram above shows you how much the German DAX Future Index fluctuate intraday. 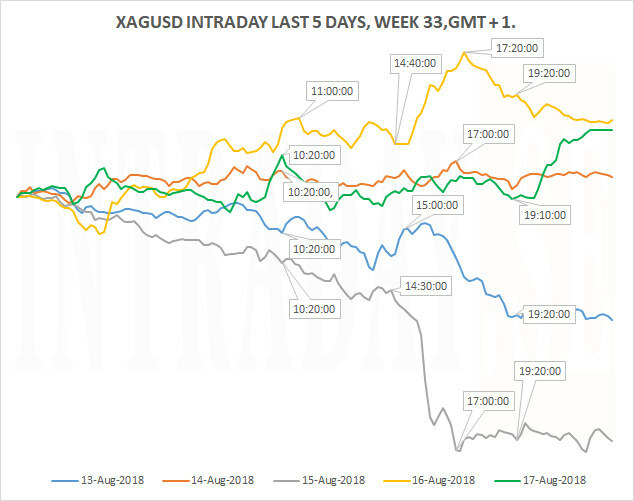 2018 (so far) shows a larger daily tradingrange than last year. The average daily moves is 181 points compared to 144 last year. 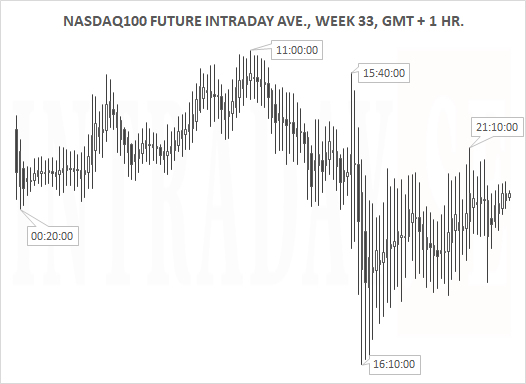 The diagram above shows you how much the Nasdaq100 Future Index fluctuate intraday. 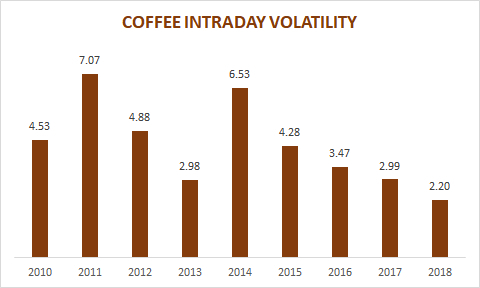 2018 (so far) shows a larger daily tradingrange than previous years. In points this means 121 in 2018 compared to 79 in 2017, and 73 in 2016. 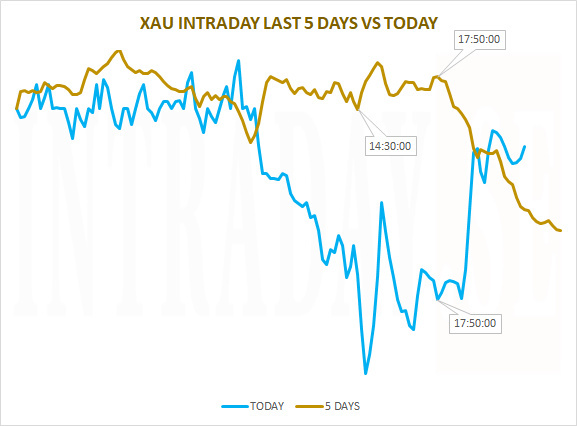 This chart is just a continuation of today's earlier post for Gold Intraday. As displayed above, the 17:50 mark proved very significant this Wednesday. 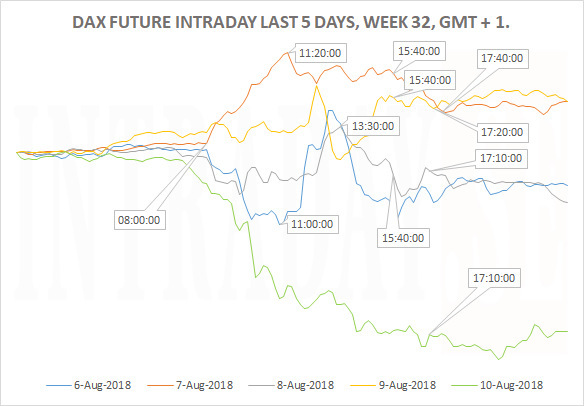 By looking for a larger move just after that timewindow based on the last 5 day average, made it possible to enter a position with a tight stop loss, and minimizing the downside risk to a trade. At present, you could thereby moved a stop loss to your entery level, of exited the entire or parts for the position with a solid profit. Note that the 17:50 o'clock window proved to be an inverse move of the last few days. Today's graph is an example of the importance of time, rather than direction. 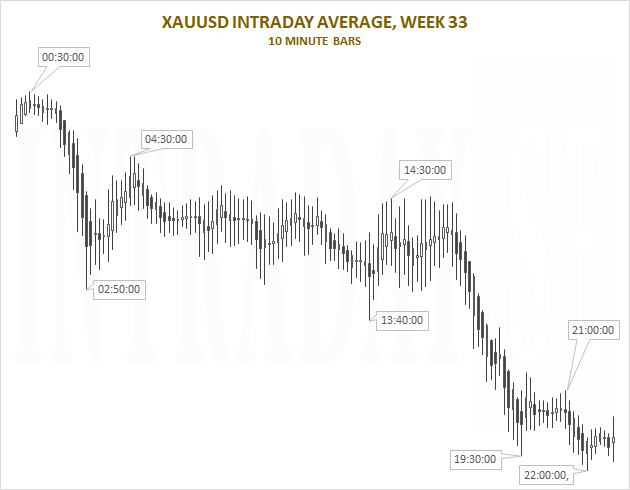 The chart displays today's Goldprice vs the average development for the prior 5 tradingsessions. 14:30 and 17:50 are upcoming times to be aware..(times are GMT + 1 HR). 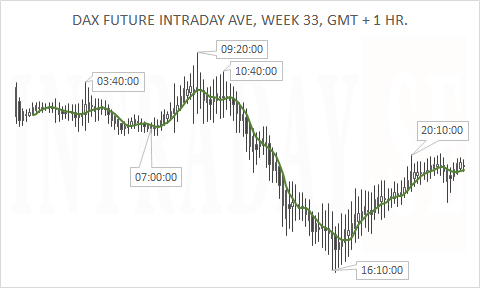 The overview displays the Nasdaq100 Future intraday over the last 5 tradingsessions GMT + 1 HR. The vertical lines are set up to put certain times into perspective for the days. As you can see, the last days shows very little movements until about noon. The next timingpoint of significance seems to be around 16:40, an hour and ten minutes after the US open. The US lunch time just after 20:00 also stands out where renewed strenght comes into play for the remainder of the sessions. It is importaint to note todays set timing points not necessarly presists in the future, and that these points in time very easily may change due to different factors. 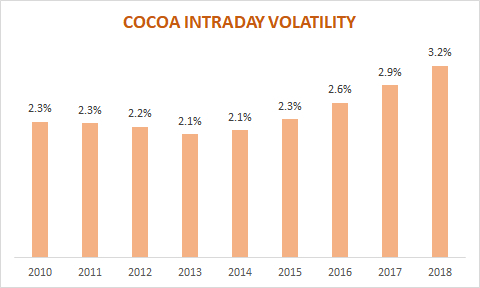 Be aware that significant timing points or certain times may act as support or resistance to a pricelevel, and history shows that these pricelevels could be triggerpoints to acceleration of an already existing trend - for shorter or longer.